Mayor Rahm Emanuel and the City of Chicago's Department of Cultural Affairs and Special Events (DCASE) are pleased to announce the full music lineup for the 38th Annual Taste of Chicago. The festival will present a diverse mix of chart-topping national and international acts at the Petrillo Music Shell, including Brandi Carlile, Juanes, yasiin bey & Talib Kweli are Black Star, The Flaming Lips and George Clinton Parliament Funkadelic. The Bud Light Stage will feature five days of free programming with top local talent. Taste of Chicago will run from July 11–15 in Grant Park. "Taste of Chicago is a summertime staple, and this year's music lineup will be even more vibrant and diverse than ever before," said Mayor Emanuel. "This level of high-caliber local, national and international musical talent will put Chicago's global reputation as a culinary and cultural capital on full display all weekend." 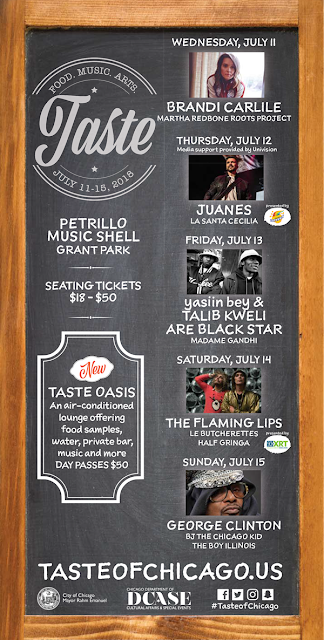 Tickets for the seating area at the Petrillo Music Shell will go on sale Friday, May 4, at 10am at tasteofchicago.us. For all Petrillo concerts, general seating tickets are $18 and premium seating tickets are $50. Admission to Taste of Chicago and lawn seating is free. Tickets will also go sale Friday at 10am for the new Taste Oasis, an air conditioned lounge in Butler Field offering tasty bites, cold water, a private cash bar, music and more. Day passes for this exclusive area are $50. Taste Oasis will be open throughout normal Taste of Chicago festival hours, but it's particularly a great spot to hang out before and after the Petrillo Music Shell concerts. Food samples will be served Wednesday, Thursday and Friday, from 3 to 6pm and on Saturday and Sunday from 2 to 5pm. Grammy® Award-nominated singer-songwriter Brandi Carlile, along with her longtime collaborators Tim and Phil Hanseroth, will headline the Petrillo stage on opening night. Their acclaimed new album, By The Way, I Forgive You, which received 4-stars in Rolling Stone, remains one of the best reviewed albums of 2018 and includes the breakthrough first single, "The Joke." Opening the evening's performances is the Martha Redbone Roots Project. Ms. Redbone is an award-winning musician celebrated for encompassing all boundaries of Americana in her music. Her latest CD, The Garden of Love - Songs of William Blake, produced by Nitty Gritty Dirt Band founder and Grammy® Award winner John McEuen, features a masterful cornucopia of roots music that includes folk, country, blues, gospel, soul and more. International Latin Pop star, Juanes will headline Taste of Chicago on day two. The Colombian musician has won more than twenty Latin Grammy® Awards and Grammy® Awards combined. He has received multiple Best Artist, Best Rock Song and Album of the Year awards for the songs "Me Enmora," "Mil Pedazos" and albums such as Juanes MTV Unplugged, Loco De Amor, Mis Planes Son Amearte and Fijate Bien–his first album in 2001. Known throughout the world, Juanes is also involved in social activism, and in 2005 established the Mi Sangre Foundation to raise awareness and help the victims affected by land mines. La Santa Cecilia is the voice of a new bicultural generation. In 2014, the band won a Grammy® Award for their major label debut Treinta Dias for Best Latin Rock Album, Alternative or Urban. The band is made up of accordionist and requinto player Jose "Pepe" Carlos, bassist Alex Bendaña, percussionist Miguel "Oso" Ramirez and vocalist "La Marisoul." For the third day, Black Star, the Brooklyn hip hop duo formed in 1997 by rappers yasiin bey (Mos Def) and Talib Kweli, will headline. Arising from the rap underground movement of the 1990s, Black Star has put out a number of singles and one album Mos Def & Talib Kweli Are Black Star released in 1998 to critical acclaim and now celebrating its 20th Anniversary. While both Mos Def and Talib Kweli have gone on to even greater commercial and critical success in their solo careers, they together helped shape underground alternative rap and bring it into the mainstream. Kiran Gandhi, who performs as Madame Gandhi, is an electronic music artist and activist based in Los Angeles. Having gained recognition as the former drummer for artist M.I.A, in 2016, she released her first EP Voices, and in 2017, she toured as the opening act for Ani DiFranco. Madame Gandhi is currently working on her debut full-length album and her mission is to elevate and celebrate the female voice. The Flaming Lips, from Oklahoma City, Oklahoma, have been together since 1983. They are famous for their elaborate live shows, which feature costumes, balloons, puppets, video projections, complex stage light configurations, giant hands, large amounts of confetti, and frontman Wayne Coyne's signature man-sized plastic bubble, in which he traverses the audience. Something to keep in mind for your bucket list, in 2002, Q magazine named The Flaming Lips one of the "50 Bands to See Before You Die." Le Butcherettes is a garage punk band from Guadalajara, Mexico, and now based in El Paso, Texas. They have collaborated with a number of well-known artists including Jello Biafa of the Dead Kennedys, John Frusciante of the Red Hot Chili Peppers and Iggy Pop, among others. Le Butcherettes have a dedicated fan base thanks to their unforgettable live shows and genre-defying music. Chicago's Half Gringa is set to kick off Saturday's performances,led by Izzy Olive. Their debut album Gruñona explores the confluence of Latinx and Midwestern identity and was named one of Chicago Magazine's 10 Best Chicago Albums of the Year in 2017. This evening's entertainment at the Petrillo Music Shell is presented by 93XRT. George Clinton Parliament Funkadelic revolutionized R&B in the 1970s, twisting soul music into funk. With hits like "Flash Light," "Aqua Boogie" and "(Not Just) Knee Deep," George Clinton influenced the rise of funk-inspired rap and funk rap in the early 1990s, establishing the status of Clinton & Co. as one of the most important forces in the history of black music. His music has become the soundtrack for the rap movement. With renewed notoriety and respect, the award-winning George Clinton Parliament Funkadelic inspiration, dedication and determination have resulted in the elevation of funk as a true genre in and of itself. BJ the Chicago Kid is a Chicago artist on the rise. Bryan James Sledge (aka BJ the Chicago Kid) proved his knack for soul with 2012's self-released album Pineapple Now-Laters, a diverse collection of songs that included "His Pain" featuring Kendrick Lamar. In My Mind, his major label debut on Motown, transcends basic classification. The project is as imaginative as its title implies but as real as BJ the Chicago Kid's love for music. The Boy Illinois composes and delivers lyrics with a raw and unabashed eloquence, weaving together prose and poetry that draw upon his upbringing in Chicago. His music and lyrics are influenced by his proud Haitian heritage and a contagious energy that pulls fans deeply into each one of his songs. In 2016 he was named a winner of the ChicagoMade A&R Auditions presented by DCASE and performed at the Taste of Chicago Bud Light Stage. The hype machine surrounding his burgeoning career attracted veteran rap maverick Lupe Fiasco, who invited him on some of his recent national tours. The popular Bud Light Stage at the Taste of Chicago will offer five days of performances by Chicago's best up-and-coming and more established artists, July 11–15 in Grant Park. The entertainment stage, located at the south end of Taste of Chicago at Columbus and Balbo Streets, is open from noon to 8pm on Wednesday through Friday and 11am to 8pm on Saturday and Sunday. The full schedule can be found at tasteofchicago.us. All Bud Light Stage performances are free. This year, DJ Mike P will emcee the stage and spin each evening's final set. The lineup offers an eclectic mix of genres and Chicago artists on the rise. Highlights include seven ChicagoMade A&R Audition winners that were selected by a panel of music executives in October 2017. Taste of Chicago is produced by the Department of Cultural Affairs and Special Events in coordination with the Illinois Restaurant Association, which manages food and beverage operations. The festival is sponsored in part by 93XRT, Bud Light, CH Distillery, Chicago Transit Authority, Chicago Tribune, CLTV-Chicagoland's Television, Communications Direct, Eli's Cheesecake, IL Lottery, Lifeway Foods, Pepsi, Shoreline Sightseeing, Southwest Airlines and WGN-Television. The 37th Annual Taste of Chicago is July 5–9 in Grant Park with hours 11am–9pm, Wednesday–Friday, and 10am–9pm, Saturday and Sunday. For more information on the FREE admission festival, visit tasteofchicago.us. To plan your trip to Chicago, visit choosechicago.com. Join the conversation on Facebook at Taste of Chicago and follow us on Twitter, @TasteofChi (#TasteofChicago) and Instagram, @ChicagoDCASE (#TasteofChicago). The Department of Cultural Affairs and Special Events (DCASE) is dedicated to enriching Chicago's artistic vitality and cultural vibrancy. This includes fostering the development of Chicago's non-profit arts sector, independent working artists and for-profit arts businesses; providing a framework to guide the City's future cultural and economic growth, via the 2012 Chicago Cultural Plan; marketing the City's cultural assets to a worldwide audience; and presenting high-quality, free and affordable cultural programs for residents and visitors.